Articles, features and stories with an emphasis on geology. A team of researchers, including scientists from the Field Museum (Chicago, USA), the University of Witwatersrand (South Africa) and the Burke Museum (University of Washington, USA), have published a scientific paper announcing the discovery of an archosauriform archosauromorph, that roamed Antarctica in the Early Triassic. The fossil discovery suggests that early Archosaurs were more geographically widespread than previously thought and demonstrates that the biota of Antarctica may have been very different from other parts of the super-continent Pangaea as the planet recovered from the End-Permian mass extinction event. 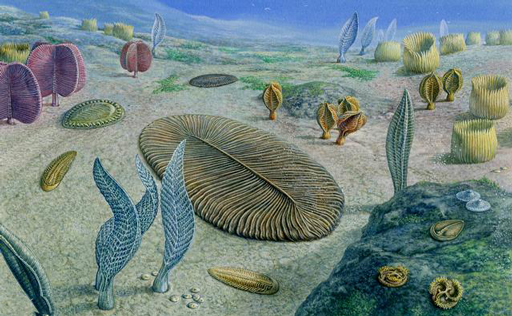 A typical scene in Antarctica during the Early Triassic. Antarctanax is in the left foreground. The illustration above depicts a typical ecosystem that existed in Antarctica approximately 250 million years ago. Along the banks of a river, three Archosaur inhabitants of the dense Voltzia conifer forest cross paths, Antarctanax shackletoni attempts to sneak up on an early titanopetran insect, an archosauromorph Prolacerta rests on a log, and an enigmatic large Archosaur pursues two unsuspecting Dicynodonts, (Lystrosaurus maccaigi). The fossil skeleton is far from complete. The material was collected from a site representing Lower Fremouw Formation deposits in the central Transantarctic Mountains. The fossils consist of cervical and dorsal vertebrae, a single humerus and foot bones. The reptile has been named Antarctanax shackletoni. The genus name means “Antarctic King”, although this ancient, basal member of the group of reptiles that was to give rise to the dinosaurs, pterosaurs, crocodiles and birds, was probably not an apex predator. This cannot be stated with certainty, after all, only one fossil specimen has been found, but Antarctanax shackletoni co-existed with a number of other vertebrates including amphibians, synapsids and at least one large archosauriform, which may have been the top predator. The species name honours the polar explorer Ernest Shackleton. It is suggested that Antarctanax hunted insects as well as smaller vertebrates. Brandon Peecook, a member of the Integrative Research Centre, at the Field Museum explained that this fossil find (made in the 2010/11 field season), is significant because it demonstrates that the ecosystem in Antarctica bounced back relatively quickly after the End-Permian mass extinction event and that archosauriforms were quite widespread at this time. The fauna of the Lower Fremouw Formation traditionally has been considered to represent a subset of the Lystrosaurus Assemblage Zone of the Karoo Basin of southern Africa, with discrepancies largely a result of pronounced differences in sampling intensity. However, a review of recent changes to the fauna, as well as a reassessment of occurrences based on older literature, indicates that significant discrepancies, including the co-occurrences of taxa known from both earlier and later in time and the presence of endemic forms in Antarctica, exist between the faunas of the Lystrosaurus Assemblage Zone and Lower Fremouw Formation. In essence, Antarctica 250 million years ago had a different ecosystem to that associated with the contemporaneous Karoo Basin deposits. As life on Earth recovered in the Early Triassic, so the Archosaurs rapidly diversified and laid the foundation for the evolution of the Dinosauria, Pterosauria, crocodiles and those other Archosaurs still very much with us today – the Aves (birds). Everything Dinosaur acknowledges the assistance of a press release from the Field Museum (Chicago), in the compilation of this article. The scientific paper: “A Novel Archosauromorph from Antarctica and an Updated Review of a High-latitude Vertebrate Assemblage in the Wake of the End-Permian Mass Extinction” by Brandon R. Peecook, Roger M. H. Smith and Christian A. Sidor published in the Journal of Paleontology. The seaside town of Hastings in East Sussex is steeped in history. It is synonymous with the battle that began the Norman conquest back in 1066 but scientists have been aware for many years that the cliffs to the east of the town contain evidence of much older inhabitants – dinosaurs. Researchers from the Department of Earth Sciences at Cambridge University have published a paper this week documenting dozens of Early Cretaceous dinosaur tracks and footprints that represent at least seven different kinds of dinosaur. Examples of two iguanodontian footprints from the Lee Ness Sandstone (Ashdown Formation). The footprints and trackways were identified and mapped by a team of researchers from Cambridge University between 2014 and 2018, following periods of extensive coastal erosion along the cliffs to the east of Hastings. The footprints range in size from 2 cm wide to over 60 cm across. These prints and tracks record a rich and diverse dinosaur fauna from the Lower Cretaceous – Lee Ness Sandstones (Ashdown Formation), which date from approximately 140 million years ago (Berriasian faunal stage of the Cretaceous). The exact age of the Lee Ness Sandstone strata is unknown, however, the Ashdown Formation is estimated to be around 145-133 million years old, based on relative dating of ostracod fossils. The researchers, writing in the academic journal ” Palaeogeography, Palaeoclimatology, Palaeoecology”, report on more than 85 exceptionally well-preserved dinosaur footprints, comprising prints from at least seven different types of dinosaur (ichnogenera). They document the trace fossils eroding out of cliffs and their work records the greatest diversity of dinosaurs in a single location in Cretaceous-aged rocks found in the UK. In particular, a variety of armoured dinosaurs (Thyreophora) are represented. A footprint ascribed to an armoured dinosaur (Thyreophora) from the Lee Ness Sandstone (Ashdown Formation). The print has been assigned to the Tetrapodosaurus ichnogenus. The trace fossils are preserved in remarkable detail. Impressions of skin, scales and even toe claw impressions have been preserved. A close view of an iguanodontian claw impression preserved within one of the dinosaur footprints. Some of the tracks from recent rock falls show skin impressions. This is the skin impression from the underside of an iguanodontian footprint. The best preserved prints come from large blocks of stone that are mapped and photographed after recently falling from the cliff. The tracks are quickly eroded with prolonged exposure to the elements and from damage caused by further rock falls. When dealing with a rapidly eroding cliff, it is essential that any fresh rock falls are examined and any fossils contained within the blocks are mapped and measured. The effect of weathering on the trace fossils. Over 12 months the tracks are heavily eroded. The Ashdown Formation is part of the Wealden Group of rock formations, the most important sequence of dinosaur fossil bearing strata in England. Numerous fossilised footprints are associated with the Wealden Group and the first report of tracks was made in 1846 by the Reverend Tagart, who described a series of three-toed prints, which he thought had been made by giant birds. Never before has such a diverse footprint assemblage been mapped and documented in the British Isles. A table showing the number and characteristics of the Hastings dinosaur footprint fossils. The footprints along with the various plant fossils and invertebrate trace fossils (burrows), are helping the scientists to put together a picture of life in this part of the world in the Early Cretaceous. Dinosaurs dominated the biota, with several different types of meat-eating dinosaur (Theropods) identified, including a potential dromaeosaurid-like dinosaur, as two-toed prints (didactyl) have been found. Examples of different types of Theropod footprint (Lee Ness Sandstone – Ashdown Formation). The picture above shows four different types of Theropod footprint identified at the Hastings site. Picture (A) shows a large tridactyl (three-toed) cast with a long digit III and a faint heel impression. The footprint in (B), is also large but the toes are narrower and elongated, maintaining a consistent width for their whole length. The cast has no heel pad impression. The Theropod morphotype (C), represents a much smaller animal with digit III being much longer than digits II and IV. Intriguingly, the researchers have also logged potential two-toed prints (D), this suggests that this floodplain, braided environment might have been home to dromaeosaurid-like dinosaurs. Although, the majority of the footprints have been ascribed to Ornithopods, and several are referred to as iguanodontian, none of these prints were made by a member of the Iguanodon genus. Iguanodon (I. bernissartensis), lived many millions of years after these prints were formed. There have been many different types of iguanodont described, it is possible that the larger prints were made by an animal such as Barilium dawsoni. The slightly smaller prints could have been created by the iguanodontid Hypselospinus (H. fittoni). Trackway assigned to a small, Ornithopod dinosaur. Anthony Shillito is focusing on the role played by dinosaurs in terms of shaping their environment, how dinosaurs behave as zoogeomorphic agents. Large animals today, such as elephants and hippos can alter their habitats as they interact with their environment. Hippos for example, can create river channels and divert the course of water flow. Dinosaurs very probably did the same, with larger dinosaurs having a bigger impact than smaller dinosaurs. Footprint evidence indicating the largest dinosaurs of all, the presence of Sauropods is virtually absent from the site. Three poorly preserved trace fossils have been tentatively ascribed to the Sauropoda, although they are very indistinct and could represent under traces representing the tracks of other ichnogenera. It is very likely that there are many more dinosaur footprints hidden within the eroding sandstone cliffs of East Sussex, but the construction of sea defences in the area to slow or prevent the process of coastal erosion may mean that they remain locked away within the rocks. The scientific paper: “Dinosaur-landscape Interactions at a Diverse Early Cretaceous Tracksite (Lee Ness Sandstone, Ashdown Formation, southern England)” by Anthony P. Shillito and Neil S. Davies published in Palaeogeography, Palaeoclimatology, Palaeoecology. Team members at Everything Dinosaur have been busy preparing for the arrival of the first batch of new for 2019 Schleich prehistoric animal figures. In this first set of models from the German-based manufacturer, there is a replica of the armoured dinosaur called Animantarx (Animantarx ramaljonesi), a fact sheet providing information about this nodosaurid is being compiled, so that customers of Everything Dinosaur can learn about this enigmatic member of the Thyreophora (shield-bearers). The disarticulated and fragmentary fossils representing a single, individual animal were described in 1999 (Carpenter, Kirkland, Burge and Bird) and Animantarx is one of numerous Ankylosaurs known from the Cedar Mountain Formation of the western United States. The Cedar Mountain Formation has the highest concentration of ankylosaurid species of any Lower Cretaceous formation, it is hoped that further field work will help palaeontologists to build up a better picture of their evolution and subsequent radiation. It has been suggested that given the numbers of armoured dinosaurs present in the strata, ankylosaurids can be used to help with relative dating of rock layers (biostratigraphy). A scale drawing of the armoured dinosaur from Utah – Animantarx ramaljonesi. Recent research has identified three distinct dinosaur-based faunas represented by the vertebrate fossils from the Cedar Mountain Formation. Ankylosaurs are the most common dinosaur of the upper part of the Yellowcat Member and Poison Strip Sandstone of the Cedar Mountain Formation but are rare in other members. This scarcity may be due to insufficient collecting in the middle and upper parts of the Cedar Mountain. Nevertheless, Ankylosaur dinosaurs indicate a three-fold division of the Cedar Mountain dinosaur faunas. Intriguingly, Animantarx is known from the youngest member of the Cedar Mountain Formation (Mussentuchit Member). These rocks hold a mixture of Early and Late Cretaceous dinosaur fossils – tyrannosaurids, ceratopsids, iguanodonts, ankylosaurids etc. The strata might document a migration event whereby Asian dinosaurs moved into North America via an Alaskan land bridge. This migration may have contributed to the extinction of several types of endemic North American members of the Dinosauria.